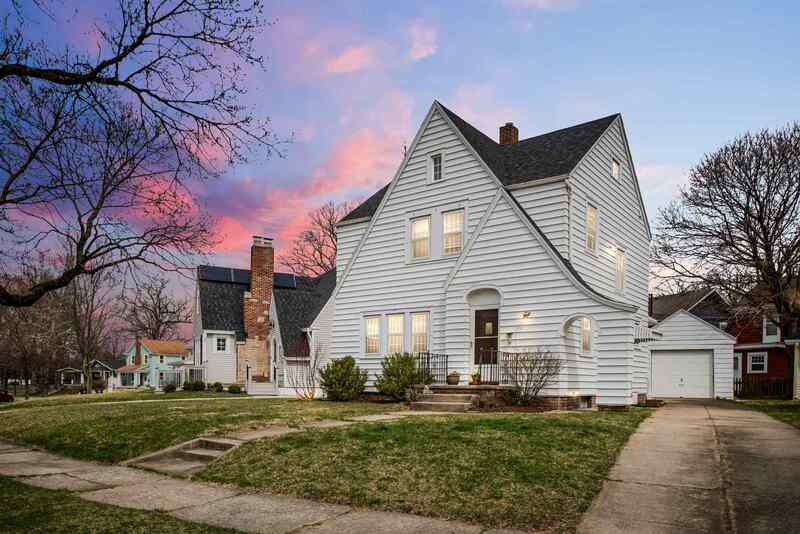 **Contingent-Accepting backup offers** Nestled in the charm of Southwood Park, one of Fort Wayne&apos;s favorite Historic neighborhoods, this quality Tudor style home includes the Historic features you&apos;ve been looking for. Step through the front door and you will note the Hardwood Floors, the unique architectural lines and the abounding natural light throughout the Living Room and Dining Room. The bright and cheery Retro style Kitchen and breakfast area include new flooring and all appliances. Upstairs you will enjoy the character of each of the 3 Bedrooms with Hardwood Floors and original doors. The Full Bath with tile floor also provides historic architectural arches and great natural light plus great storage! If that&apos;s not enough, step out the bathroom door onto your own open porch where you can relax and enjoy the evening sky. Recent improvements include a new furnace in 2018 and a new roof with tear off in 2015. Most windows have been replaced. Basement includes utility sink in laundry area and great storage. Out the side/rear door you will find the 1 car detached garage and the quaint rear yard with picket fence. A quick walk from Foster Park, you will also find this home convenient to all the &apos;07 has to offer - The Friendly Fox, The &apos;07 Pub and just across the bridge from Hall&apos;s Drive In and The Clyde! Don&apos;t miss your opportunity to make this your new home!